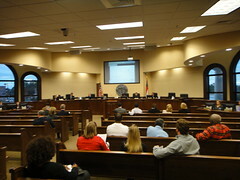 Five citizens spoke up at the 7 November 2011 Lowndes County Commission Regular Session. Some got answers, some got excuses, and some got fingerpointing. And one illustrated how the Commission doesn't follow its own rules. George Boston Rhynes asked about Open record requests and jail deaths and got the same excuses he's heard elsewhere: nobody seems to be responsible for supplying information to the public about what's going on in the Lowndes County Jail. John S. Quarterman asked the Commission to video meetings like the Lowndes Board of Education does, and got a slightly different excuse this time than the many previous times he's made similar requests. Matt Portwood asked the Commission or the individual Commissioners to state a position on school consolidation and was told they weren't going to. The VDT printed that much the next morning, the morning of the election with the referendum on school consolidation. They did not print Chairman Paulk's allusion to his already-known support for FVCS in opposing consolidation, but LAKE published a video with that on Election Day, and you can see it here. Tony Daniels wanted to know How can we pursue happiness when we don't even have a job? and had several recommendations for how the various local elected and appointed bodies could go about getting us more jobs. He also illustrated that the Commissions ordinance on Citizens Wishing to Be Heard is, as we've discovered on many previous occasions, merely guidelines at the whim of the Chairman. George Rhynes' video of the last two citizens speaking at the 7 November 2011 County Commission meeting has interesting closeups on the county staff while the Chairman was answering Matt Portwood. Then at 1:35 Tony Daniels answered the request for "any other business" by walking up to the podium and talking. ....scrutinized for these special groups of people, people of power, instead of the people that's needing the money. And I feel like there's somebody meddling in their affairs; I wish they wouldn't have. So it's not like the public doesn't already know Ashley Paulk's opinion on this subject, and it seems he was reminding us of it: he contributed money to FVCS, a group actively lobbying to prevent the school consolidation promoted by CUEE. The VDT this morning left out all the best parts of last night's exchange between Matt Portwood and Lowndes County Commission Chairman Ashley Paulk. We'll have the video up shortly so you can see for yourself. "Reading the news, I found that both school boards and the City Council have come out with either a statement or a resoultion with their stance on school consolidation. I'm just curious why there hasn't been a statement or resolution from you," said Portwood. "Look at your tax notes. It says county taxes and school taxes," replied Paulk. We're two totally different entities than the county school system. I don't feel like we should be meddling in their affairs. I don't think the County Commission should be weighing in on the city issue. Commissioners agreed that this was their stance on the matter." Alcohol, rezoning, hospital, debt, and an election! Because Tuesday is Election Day, the Lowndes County Commission changed its regular meeting to Monday. Work sessions are usually Monday in the morning; today the Work Session is at 4:30 PM, just before the Regular Session at 5:30 PM. It's a busy agenda, including two alcohol licenses, two rezonings, and an appointment to the Hospital Authority of Valdosta and Lowndes County (VLCHA); that's the body that authorized South Georgia Medical Center (SGMC) buying Smith Northview Hospital, after which SGMC got the County Commission to have we the taxpayers guarantee $100 million in bonds for expansion. Hm, and "SGMC Revenue Certificates" is on this agenda, too.